Faaaarrrrrkkkkk. That is the weekend of my brother in laws birthday. Guess he doesn't get a present this year. I,m in, how much worse could the weather be than last time anyway. (warning, I am famous for bring on bad things, especially if I cut my hair before I go, it will get colder). Hey Waz, we should be familiar with some of those attractions by then after the Scrapheap run. Great country up there and as we all know everyday is a good day for a ride - just some are better than others. Hope I can make it Smithy - the only thing that might hinder me is the small matter of a new grandchild being born on the other side of the world around late October. It's gonna be busy trying to fit in Scrapheap, Phillip Island MotoGP, teenage granddaughter playing soccer for Australia in Spain in November and new baby in the UK. I'll be out unfortunately. End of November is end of the teaching year for me, finishing marking etc for the end of the course makes it completely out of the question. Bob , I reckon this will be the venue for the great Aussie K skone bake off. Any challengers? After my last no show , I'm holding my definites for the moment but have the all clear from work . fingers crossed. groverK wrote: Bob , I reckon this will be the venue for the great Aussie K skone bake off. Any challengers? Maybe we can ask the reaper of grim to have the week off before the ride. Ed, the baking skills of the original poster would mean that a skone bake off would be a non-event or maybe a masterclass. would make for a top afternoon session though. think of all the judging needed. 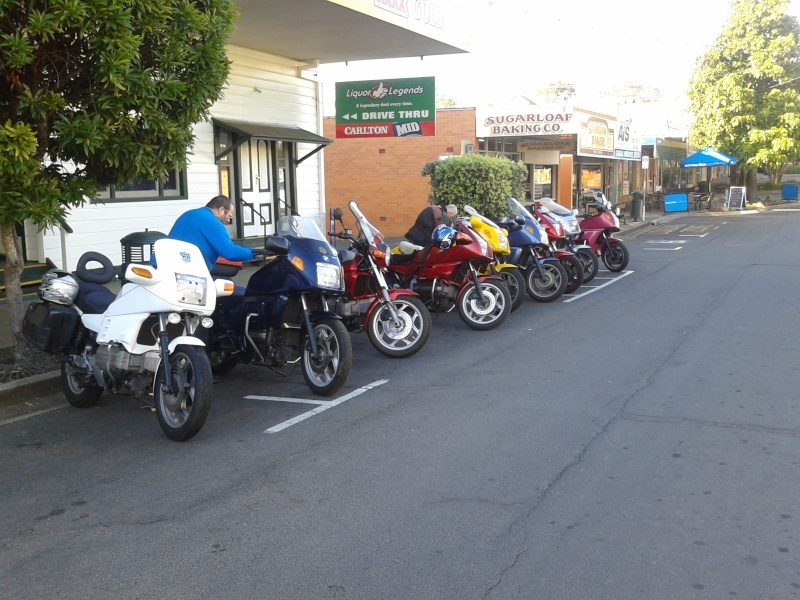 Hey it's good to see the tornadoes of last year hasn't deterred anyone from coming again, or is it that K riders will go anywhere with skones involved, no real mystery in sKone making when you have a 20ltr commercial Hobart mixer on the kitchen bench. Could be a good laugh Ed , don't know how Kay would handle biker types in the kitchen making scones! cream may not be too healthy by the time I get there. How are those roads, any improvements? I've only got one fairing mount bracket left. how about a bakers dozen for the trip. um seanii should have a couple that i made for him ....now hes fairingless may not need them ? Good point Charles, I always thought they were weak, but maybe it's best if they break not crack the fairibg. They should be about the place somewhere. Will have a look when my hands don't freeze to the shed door trying to get in! We hillbillies will certainly pop along for the ride if the Brick is painted properly etc by then! Just as long as he doesn't put a trailer behind it, otherwise it'll be like trying to pass a road train through the ranges. giggles !! good point ! Glad you can come Warren, there should be others coming up from your direction that you could tag along with. 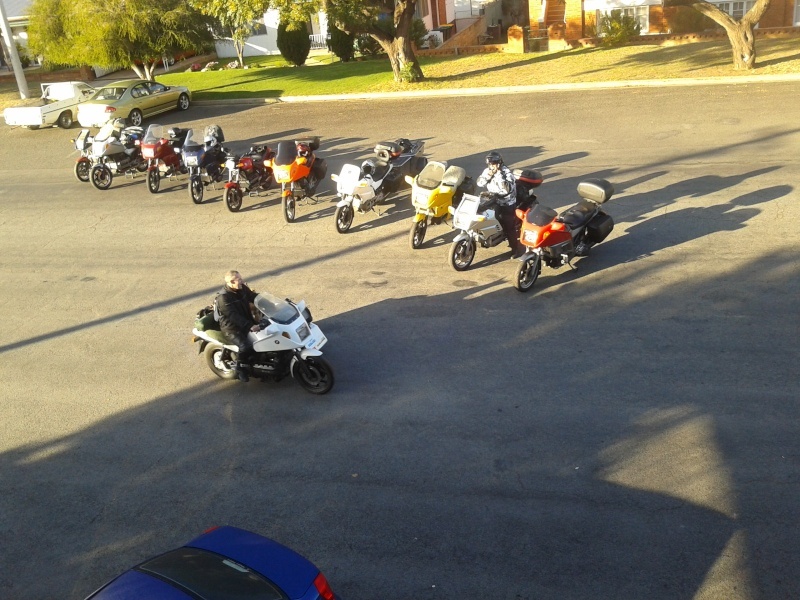 Can anyone remember how many Ks we had on last years ride, I thought we had 12 bikes and 9 were Ks. 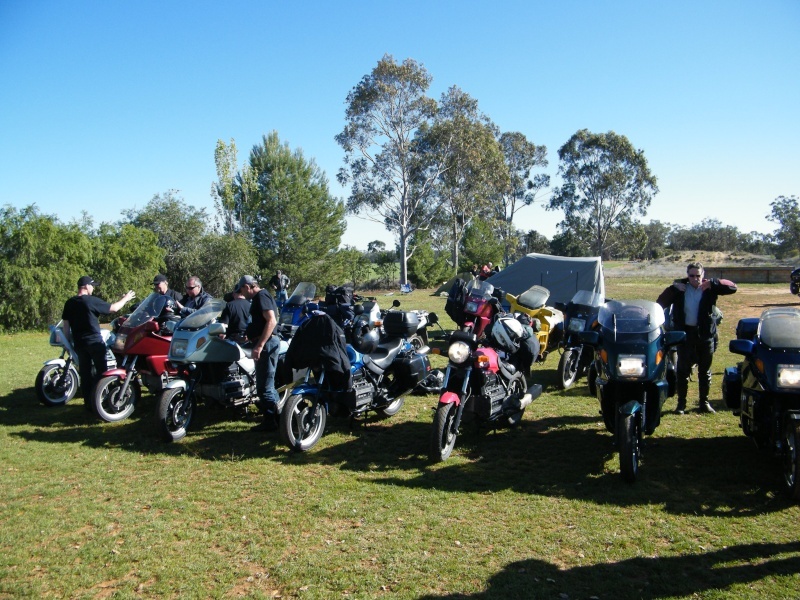 Is there a record for number of Ks on a Aussie forum ride? 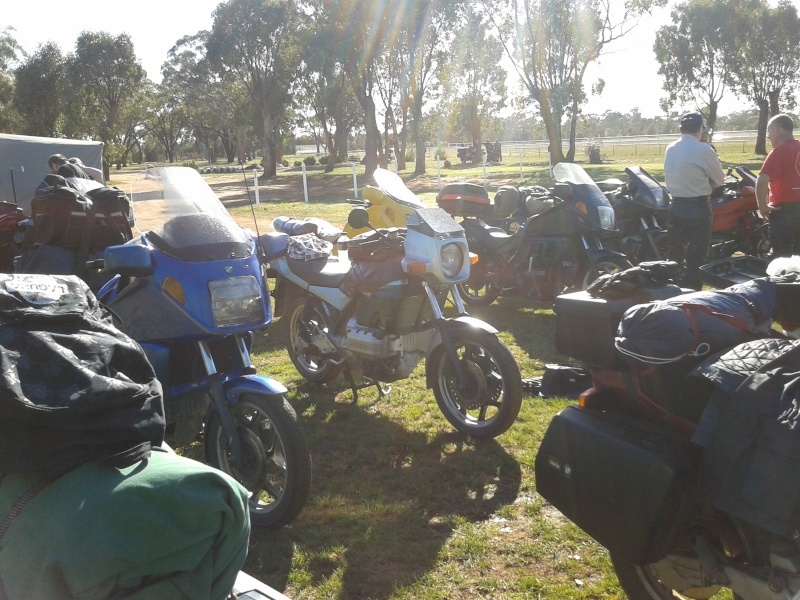 there were quite a few at Neranderra last year. good to hear you,re back Warren. and coffs harbour on the first "new england run "
Is that Rosko on a side car? Great pics Charlie, 11 looks like the magic number, surely we can muster that and more! Your right about Ghosty, when he turned up at Far cairn rally, what a ride he had. Surely Gordo must have got the trophy for longest distance that weekend . 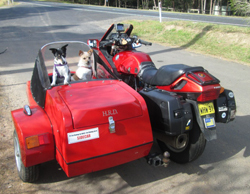 @Waz wrote: Is that Rosko on a side car? @smithy wrote: Great pics Charlie, 11 looks like the magic number, surely we can muster that and more! Your right about Ghosty, when he turned up at Far cairn rally, what a ride he had. Surely Gordo must have got the trophy for longest distance that weekend . If all goes well I will bring the red basic for a run. Hope you can make it Stan, Rosskko has already claimed the lower 40, but still plenty of tent space at "Riverdale"
Yes Waz. It is I.
Schorn was in the tub or shaving or packing up or having one off the wrist when photos were called. Poor Bella was most confused. As you can see my time was limited. Note Mr Klompy doing up his helmet. I think I had time enough till he put his gloves on before I missed muster. Damn you armed forces training. Just as an aside, if you are travelling on the New England Highway I recommend the roadhouse at Deepwater. I got to spend from late sunday arvo to lunchtime monday there last weekend when I had a flat coming back from Stanthorpe. Very helpful in arranging a new tube to be dropped off, and let me use their gear to fix it. Then Kevin the mechanic wouldnt take any money. Fuel isnt any more expensive than anywhere else and the bacon and eggs for breakfast was tasty. It's good that some people will still go out of there way to help, good info Phil. It's a bugger getting the flat though. 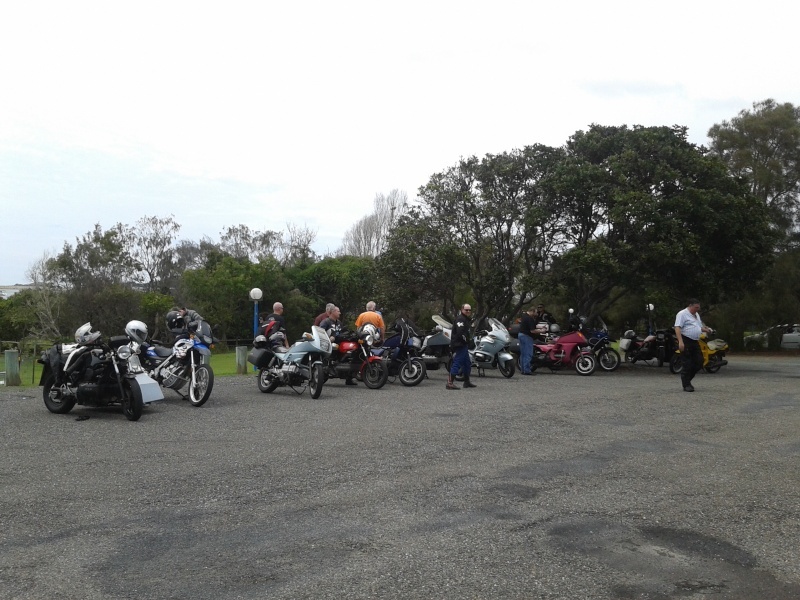 Ever since I have been riding up and down the New England Highway the people at the Deepwater Roadhouse have been friendly and it hasn't always been the same people and the Bakery across the road makes real good meat pies. The ride dates are the weekend of the 22/23 of November, there will be camping available at our farm ( Riverdale) on Saturday & Sunday. I'll get some wood together for a bonfire and BBQ on the Saturday night, then we'll have a full days ride on the Sunday. 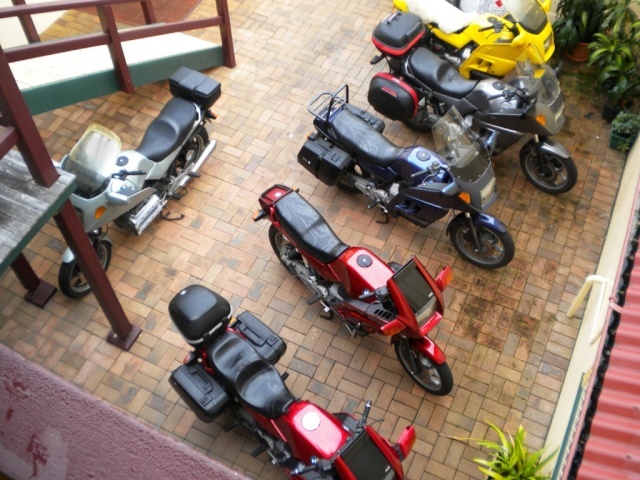 With the closure of the Coaching Station Inn and museum of interesting things, we'll still head down via Tyringham, then on to the Golden Dog hotel for lunch, then riding through the Orara valley to Coffs and back to Guyra via Dorrigo and the Waterfall Way. Thanks for the quick reply Smithy. 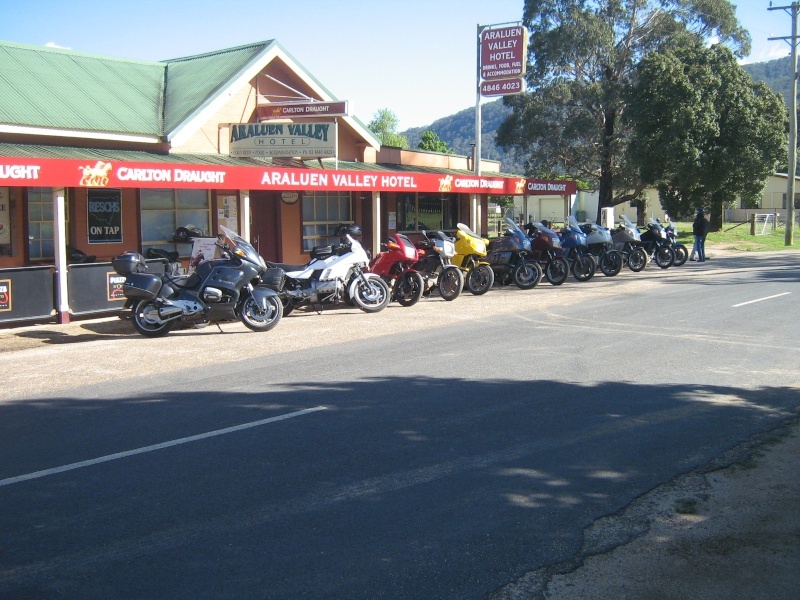 Got it in the calendar now - gives a couple of weekends breathing space between the Snowy ride Waz suggested and this one - unless of course I try to go to the Bombala Bike Show the weekend of 15/16th November as well. I might need to give up work to fit in all these rides. I'm going to try for the Saturday night at least. Have to work Monday so have to be home Sunday. Talk of numbers of K bikes at meets got me thinking about the Irish. on a couple of occasions. Are we going to stand for that! So make a big effort boys, to at least beat our own record, 'cos as you Know..
Far Kairn. Best I have got. I can positively count 12 here and Al had his chair, not shown, so 13 with quite a few others not there for various reasons. Feel free to up the count if you are not pictured or Know of the others. we'll carry your spirit along with us ghosty . unless you want to send some nicnak up here so I can take it along with me ...something typical for around your area ? and no I don't mean some larconic can of south aussie beer ...whats that horrible stuff called ??? southark or something ... shudder ..!!! @Ghost who rides wrote: I can positively count 12 here and Al had his chair, not shown, so 13 with quite a few others not there for various reasons. Feel free to up the count if you are not pictured or Know of the others.